I first tried Jeni's ice cream in Ohio where I went to school. They had several of their flavors on the dessert list of my boyfriend Matt and I's favorite date place Olive in Dayton. With flavors like goat cheese & red cherries, wildberry lavender, and pistachio & honey, its hard not to catch your eye. Every time we went to Olive for dessert we would get two scoops of ice cream for dessert. One "safe" flavor like dark chocolate and one "daring" flavor like sweet corn and black raspberry. I never met a daring flavor that I didn't like. 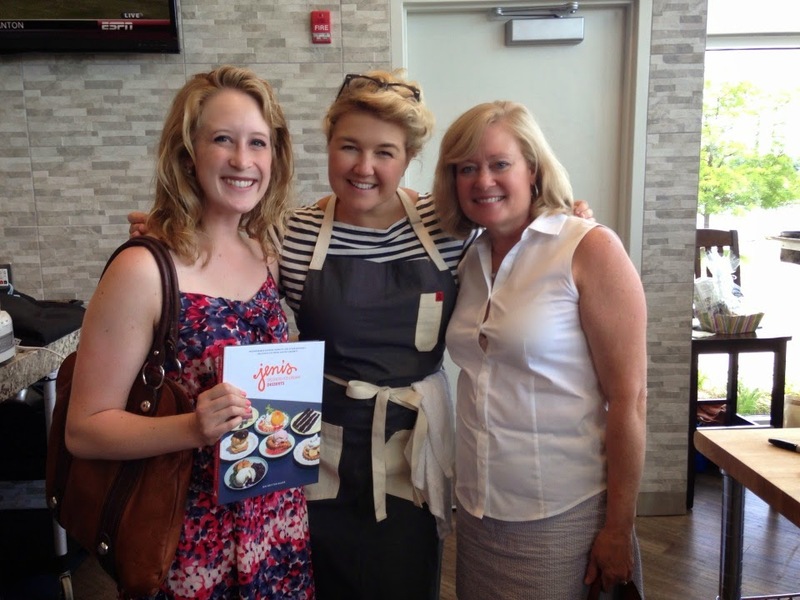 I recently saw that she wrote a cookbook called Jeni's Ice Cream Desserts which sounded like the quintessential summer cookbook. 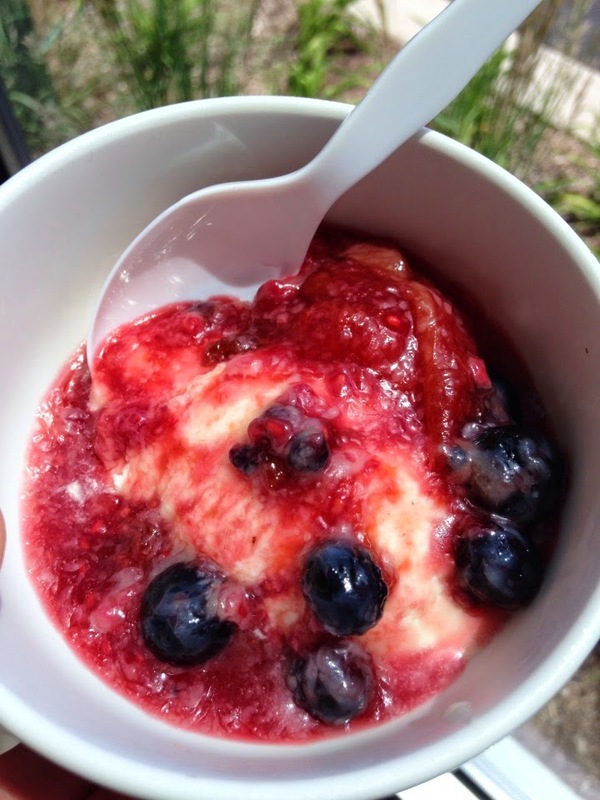 My favorite types of dessert to serve are warm that require a scoop of ice cream. My go to is my fruit crumble, but I was interested to see what other recipes she had. I looked online and found out that she had dates for a book tour that not only stopped in Chicago, but in my local grocery store. Where she was having a tasting. For free. This weekend I went to go see her at Standard Market. They had printed out the recipes for her Manchego ice cream (yes the cheese) and sautéed fruit. I love to hear people talk about what their passionate about, especially when its food because I can totally relate. She explained that she got into ice cream after getting into perfume. She uses much of the science from making perfume into making her delicious ice creams. 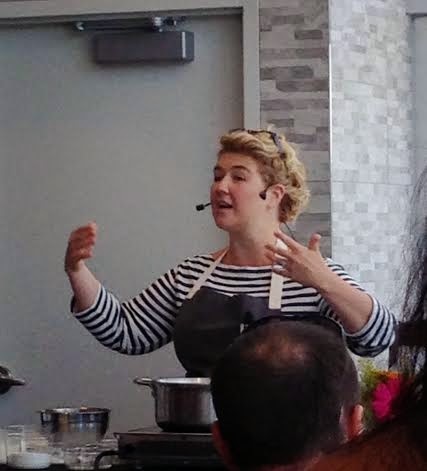 She also educated the crowd about the 4 different elements of ice cream and when to add what to change the different elements of it. It's quite a science. From there she did a cooking demonstration, showing us how she makes the ice cream. She also explains how she had to adapt her cookbook recipes for the home ice cream maker. I wish I could've been in her kitchen while she was experimenting with that. Afterward I was able to meet her and have her sign my cookbook. She recommended freestylin' her recipes which basically means putting your own spin on her recipes and flavors. I love that, just love that. Especially when it comes to desserts, I can get stuck in the recipes. Desserts for me tend to be a science where cooking is more of my art. I'm hoping to have a few delicious experiments in the coming weeks. Want to try her ice cream? Search for the nearest place here.